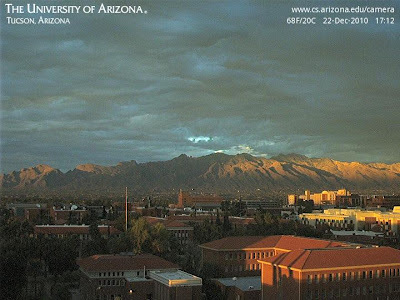 The latest visible satellite image (top) and webcam view south from Kitt Peak (bottom) show that low clouds are covering the sky here in Tucson this morning, although it was clear at times during the night. The clear skies during night led to a very cold morning here at house with low of 18F. Second coldest morning of the Fall, beat only by the 16F reading on the morning of November 30th. The storm precipitation at house was 0.42” at 7 am yesterday morning, followed by 0.21” coming by noon Thursday – total for the storm 0.63”. So the rainfall for the Fall probably ends up as: October 0.90”; November Trace; and December 1.17” for total of 2.07”, which isn’t bad for a strong la nina Fall. The Flagstaff sounding was quite interesting last evening, exhibiting a very cold (-38C) temperature at 500 mb and with the tropopause also at 500 mb. It is my feeling that this an extremely unusual sounding for Flagstaff, although I don't have a historical data base at hand to check this in detail. The nearly adiabatic conditions from the surface to 500 mb appear a bit strange, but they are similar to other very cold soundings in the West. Thus, it doesn't appear to me that this sounding is obviously bad - but it certainly seems unusual. The figures above are from the Wyoming upper-air site. Flagstaff skew-T (top), Flagstaff Stueve diagram (middle), and 500 mb chart (bottom). Note that the very cold, -35 to -38C, air at 500 mb has wrapped around the western side of the upper low in a banana-shaped arc, that extends from Spokane to Flagstaff. Can anyone tell me how often such cold 500 mb temps are observed at Flagstaff (Winslow)? Three shots of the clearing skies and mountain snow cover, all about 4:30 pm today - 30 December 2010. 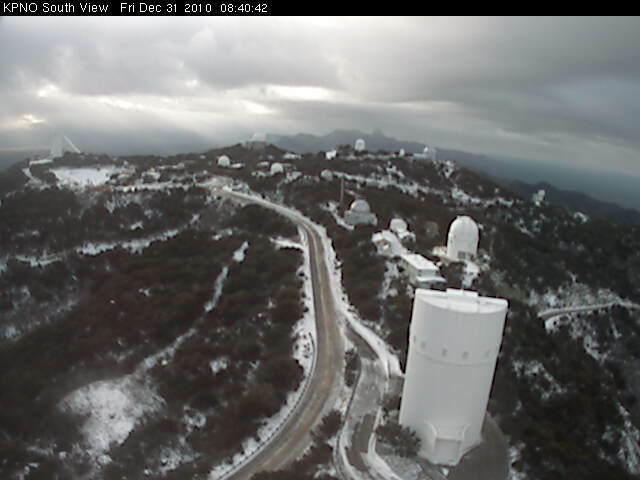 Top image shows that Kitt Peak got some snow. 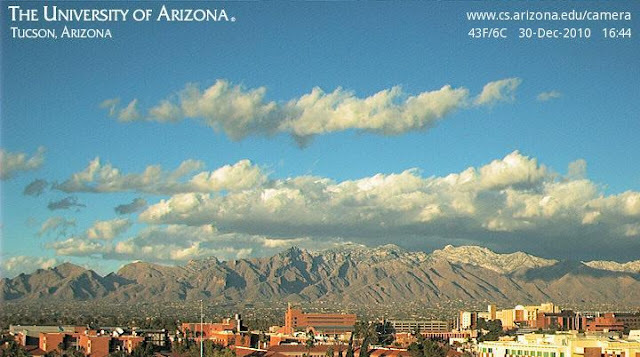 Bottom two images show the Catalinas from campus and from the backyard. Dewpoints have crashed and it will be quite cold tonight if winds go calm. The observations I'm reporting here were mostly from 7 am this morning. The cold part of storm started around 6 am here at house, with a line of moderate showers that were located along the front (NWS Tucson radar is down this morning). The top two figures show RAP and NAM 500 mb analyses for 12 UTC this morning. Most noteworthy are the temperatures near -40C in the northern Great Basin where the tropopause is right around 500 mb. The road up Mt. Lemmon was closed at 5 pm last evening - about the time of the photos shown in previous post. Jim Means reported 1.25" of rain yesterday at Alpine, California. The bottom figure is from the NWS webpage and is a graphic showing rain measurements across the Tucson metro area for period ending at midnight last night. Here at house rain gauge held 0.42" at 7 am, which was from both the warmer event and the first rainband attending the cold front. 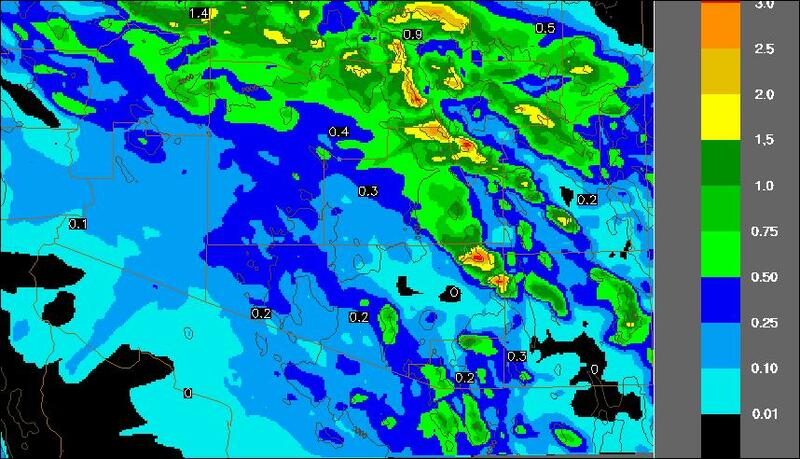 Atmo had 0.20" at midnight and an additional 0.06" at 7 am - thus, the WRF QPF was quite good from yesterday, but just a touch too dry at low elevations. ALERT Network: 100% coverage at 7 am with 19 gauges having 0.50" or more at 7 am - three of these were in Marana and rest were in the Catalina Foothills and Redington Pass, where one gauge measured just over an inch. RAWS gauges in Pima and Santa Cruz Counties: Sells rain gauge has been out of service for months and Sollers has been off line for a couple of years. Rincon and Hopkins had snow only events, which gauges can not measure. Empire had 0.28"; Sasabe had .34; and Saguaro had 0.57". So, December's third precipitation event here in the metro area is still underway - really quite good for an el nina winter! Two views of the Catalinas this evening. 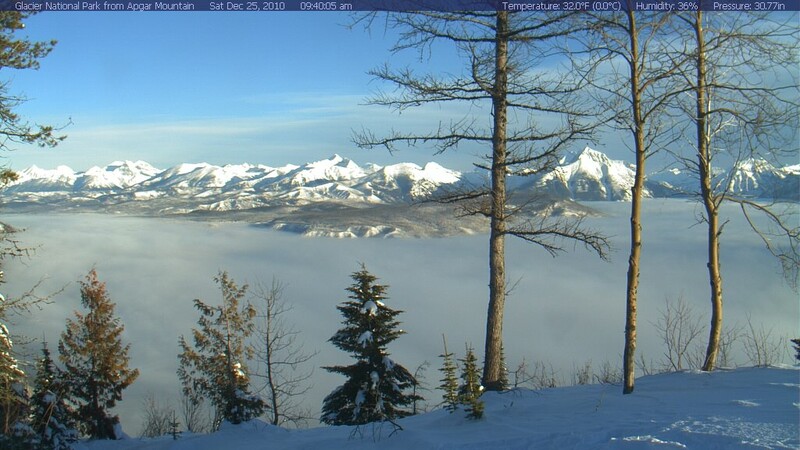 Top is from a new web cam up at Summerhave on Mt. Lemmon (thanks to Mike Hardiman for alerting me that this had become available). Looks like some roads are already snow-covered up near 8,000 ft at 5 pm. 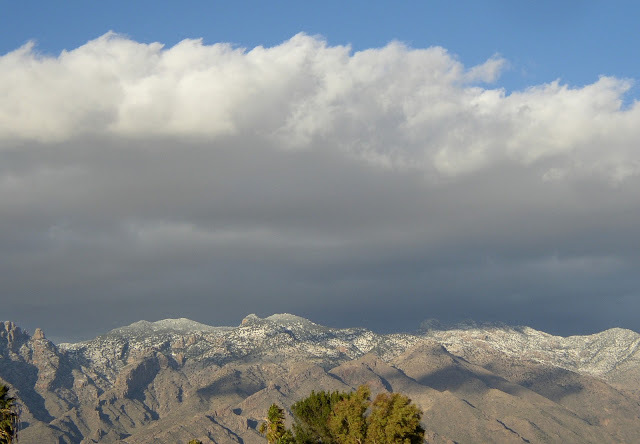 Bottom is photo from house at a bit after 4 pm showing snow falliing on the lower elevations of Catalinas to our north. It has just recently rained hard enough here to wet the flagstone on the patio. 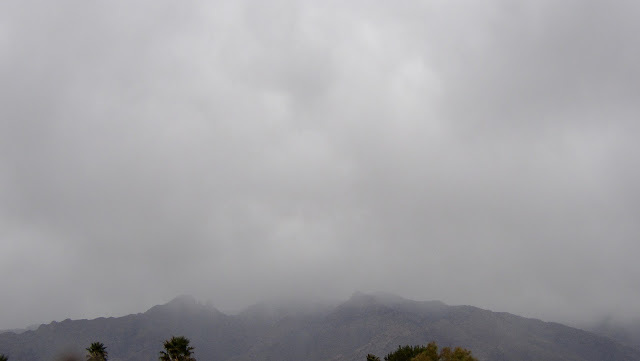 Clouds in the Tucson area have thickened in the past hour or so and precipitation has started in the Catalinas. A key question for short-term and small scale forecasts is how long the highway up to Summerhaven will remain open. It will undoubtedly be closed sometime in the next few hours and some who might be tempted to drive up into the snow this afternoon may well end up stranded on the mountain. I've grabbed some products from the model runs this morning. The top graphic is NAM forecast precipitation for period ending at 1200 UTC tomorrow morning (30 December 10). The NAM forecasts a general precipitation event, with some amounts in southeast Arizona reaching over an inch. The middle image is total precipitation forecast by the Univ. of AZ WRF-NAM high-resolution model from this morning's run. The WRF-NAM forecasts a very distinct difference between the storm's impacts on the mountains versus low elevations.Note that only a couple of tenths of an inch are predicted in the Tucson metro area and in much of the Santa Cruz Valley - probably due to forecast strong downslope winds across the higher terrain to the southwest. In the southeast part of state the model continues to forecast maximum precipitation to occur in the Catalinas. Since people down here rarely have to face snow-covered roads, there are several other very important forecast issues related to driving conditions. For example, will Highway 83 become snow covered and icy at the high points between I-10 and Sonoita (this is a particularly treacherous stretch of highway even in fair weather)? Will all the roads become icy in the southeast Arizona grasslands? 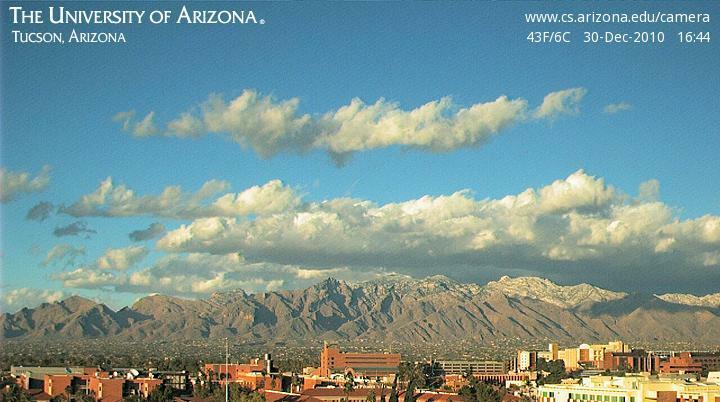 Will I-10 become snow covered on the high terrain between Tucson and Benson; over the pass called Texas Canyon? east of Wilcox? The WRF-NAM forecast of snow accumulation through tomorrow morning (bottom) keeps the accumulations at high elevations and says "No" to all the questions above - except of the course the one about the Catalina Highway. So we are now in the observing phase of this storm. Note - just had a call from my son who is at a resort north of Durango CO at about 8,000 ft elevation and he reports that snow is piling up at 2 to 4 inches per hour there! Second note - it's taken me so long to put this post together that I see that it has started to sprinkle here at the house. Much of the West is already experiencing rain or snow this morning, as the large storm system consolidates. 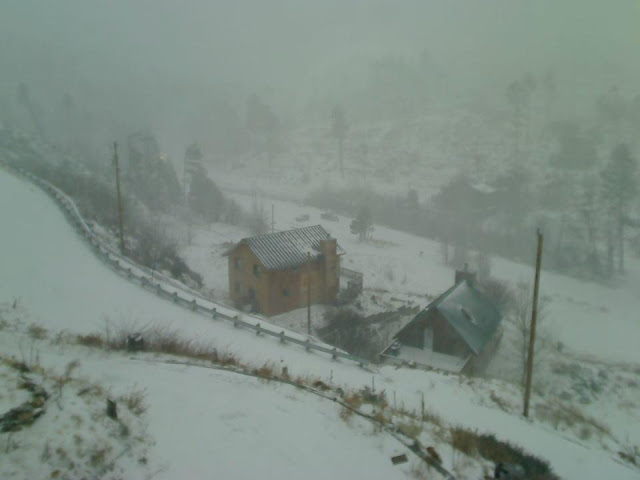 Here in Arizona snow is falling at higher elevations across the northwest third of the state. The 1200 UTC 500 mb analysis from NCAR RAP (top) indicates that the short wave is strung out north-to-south from western Canada (where 500 mb temps are -40C and colder) to off the southern California coast (where the previously mentioned subtropical moisture plume has come ashore, extending far into the interior West). The nearly concurrent satellite water vapor image (middle graphic - the water vapor channel is centered above 500 mb but it is very useful for diagnosing the structures within this system) for the eastern Pacific indicates a complex structure. The moisture plume from north of Hawaii is apparent, and it appears that a short wave has pulled eastward with this plume, comprising the southern part of the storm system, and located west of southern California. The very cold, northern short wave/cutoff is also apparent along the coast of Washington and over Vancouver Island. The comma-shaped feature near Yuma, Arizona, is likely an artifact due to orographic cloud streaming off the coastal mountains. The 12 UTC NAM 500 mb analysis, with vorticity, is shown in the bottom panel. The model analysis appears to confirm the complexity of structures present. There are several disorganized, orographic-related?, vorticity maxima inland over the central and northern Rockies. The short wave associated with the Hawaiian moisture plume is indicated by a distinct vorticity maximum from the east Pacific into central California. The primary vorticity maxima off the Washington coast is being fed by an intense vorticity ribbon, or streamer or tail, that is originating somewhere off to the far west of Alaska. As the 500 mb cutoff consolidates and digs southward there will be abundant, small-scale, short term forecasting challenges for western US forecasters. I'll discuss a few of these in the next post. Roger writes: I never would have expected to hear you admit to forsaking diagnostics for prognostics, but at least I have to give you credit for the courage to do so. What brought this about? Was it bedazzlement by the increasing precision (and accuracy) of the progs in most situations? Distraction? A cost/benefit argument in terms of time spent? Some other factor? I'm trying to grasp how attaining the most thorough possible grasp of the current state of the atmosphere (i.e., via all available forms of analysis, manual and digital) can become so unimportant to predicting future conditions. [If nothing else, it's a troubling phenomenon I might need to explain to Al Moller--a world-renowned chart analyst in his own right--when I see him in a couple of days...and understanding this trend better sure would help.] The name Snellman keeps coming to mind, for reasons that you, more than most, would understand. This is a battle I'm fighting but losing at my unnamed workplace also, where upper-air analysis (and even high-quality surface analysis at times) seems to be losing ground fast to the tantalizing glimmer (or is it addictive drug?) of ever-more variegated and precise forecast progs. Will I be the last forecaster on earth doing hand analysis by the time I retire? In a blog post below, from Christmas Eve, I noted that the GFS was more agreesive than the ECMWF at 168 hours and that ALL of the GFS ensemble members were forecasting precipitaion over southeast Arizona for this week. The early morning NWS forecast (made about 2 am today - Tuesday December 28th) today has precipitation POPs for metro Tucson at 70% for Wednesday, 100% for Wednesday night, and 60% for Thursday, as well as alerts for a significant winter storm above 5000 ft msl elevations. Thus, the large-scale, long range, forecasts at the end of last week appear to have been remarkably accurate. This coming event (I'm assuming of course that I can rely on the models!) illustrates two things for me: 1) how very much the large-scale numerical forecast models have been improved during the last decade or so, and 2) how model-dependent current operational forecasting has become. I personally find the increase in accuracy of the models quite astounding - something that I would not have anticipated 10 to 15 years ago. The nitty-gritty details on smaller scales remain at times elusive - as well illustrated by the extensive SUNY MAPS disucssions leading up to Sunday's great blizzard in the Northeast. Above at top, I show the GFS ensemble mean and spaghetti chart 500 mb forecast valid at 1200 UTC this morning. The not very impressive, low-amplitude, wave in the Gulf of Alaska is the feature that is forecast to become the significant, and very cold, cut-off storm event over the western US. This feature appears, on the analysis charts, rather innocuous, yet all the models dig this wave rapidly south-southeastward and amplify it significantly. The agreement of all the ensemble members continues through 60-hours (see right panels of top and middle graphics - white line is the operational member's forecast). A further key to the evolving weather event is the significant plume of Pacific moisture (bottom panel) from west of Hawaii. The large-scale models have obviously picked up this feature, and its interaction with the digging short-wave leads to a much more significant storm event than might occur if this moisture influx were not available. All of this is quite amazing to this old-timer. Edited at 4 pm to add emphasis (red) and a couple of additional things (blue). The weather action will quickly shift out West this week. The top panel shows precipitable water over the Pacific and indicates another large moisture plume developing from west of Hawaii toward the continental Northwest US. The middle panel is from the 11 pm forecast run of the U of AZ WRF-GFS model. The figure shows model forecast accumulated precipitation ending at 11 pm on the 29th of December. 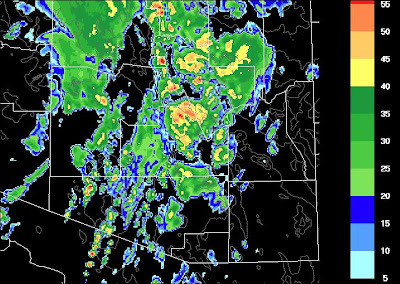 The WRF predicts the first part of the storm will mostly impact the higher elevations of southeast Arizona. The precipitation amounts in the Catalinas are quite large - the WRF has been fairly accurate, albeit somewhat wet, for the Catalinas forecast of the past several storms. So, we should watch the evolution of this event - the model is forecasting very strong, upslope winds at 850 mb from the south-southwest into the Catalinas. 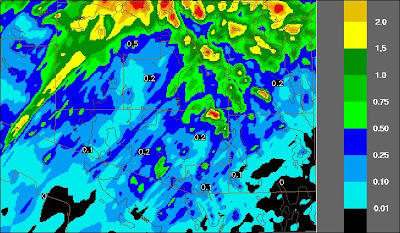 The bottom panel shows this morning's 12 UTC NAM forecast of total precipitation for the same period as the middle panel. The NAM has the precipitation further north and west than does the WRF, indicating a slower onset in the NAM forecast. Looking further out in the NAM forecast, I note that it does not forecast 1000-500 mb thicknesses to drop as low as does the GFS. So snow levels may pose a bit of a forecast challenge, as the GFS takes them very low. Regardless, an interesting week on tap for Western US weather watchers! All the media attention for the next couple of days will be upon the huge Nor'easter and its impacts (see middle GFS forecast for 5 pm this afternoon 26 December) upon much of the eastern US. Looks like a longer-than-expected Holiday weekend for many. Here in the Southwest a much weaker system will be moving across Arizona today. The top image shows that one of the current PW plumes over the Pacific is pointed directly at Arizona today. 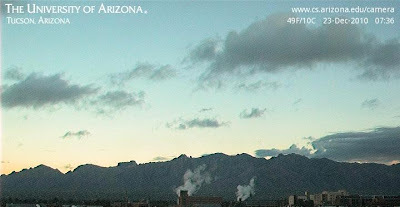 There will likely be considerably more cloudiness later today than currently anticipated in the forecast, perhaps with some light sprinkles in southern Arizona. After this system passes by, the weather action will shift to the West and northern Plains. The GFS surface forecast (operational version) for 5 PM next Thursday is shown in the bottom panel. The GFS and ECMWF are now more in sync for end of year and forecast a large, cold 500 mb low over the West. It is of note that the 1000-500 mb thickness falls to very low values across Arizona. 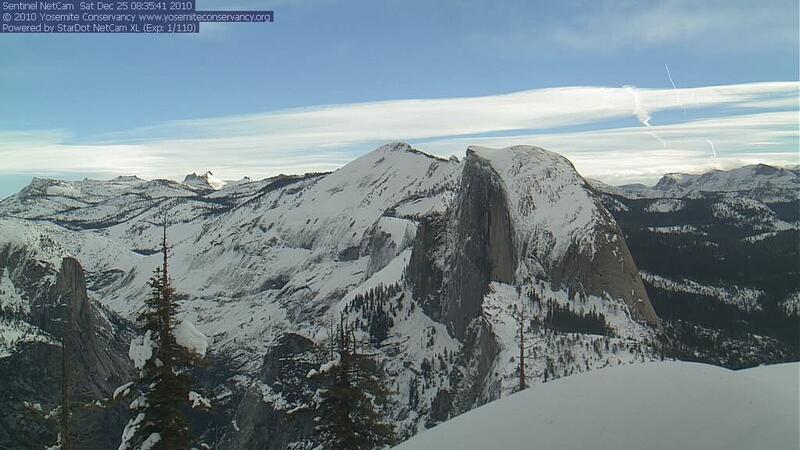 Bringing some light snow, in the forecast, to very low elevations. The bottom panel also indicates a setup for heavy snows in northeast Colorado. After Thursday, there is more uncertainty in the models, with some ensemble members forecasting another blizzard in the northern Plains and/or western Great Lakes. Truly a bonaza for weather watchers for the end of the year! 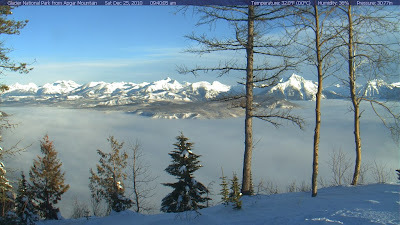 Some webcam shots around the West Christmas morning 2010. Top - Blewett Pass, Washington; Middle - Glacier National Park, Wyoming; Bottom - Yosemite National Park, Wyoming. The area around Hawaii, and off to its west and southwest, continues to be very moist and acting as a nearly stationary source region for extensive moisture plumes. The top image shows the east Pacific PW product from CIMSS (at Univ. of Wisc. in Madison). Two intense systems that are strongly blocked in the western Pacific and east Asia are pulling a large stream of moisture back to the northwest toward Asia. The deep 500 mb trough south of Alaska has pulled a separate moisture stream north-northeastward to British Columbia. A very very interesting situation across all of the Pacific, and I don't have any real feel for how unusual all of this might be. The bottom two panels show operational versions of the 500 mb forecasts valid at 168 hours (0000 UTC Friday December 31st) from the 0000 UTC model runs last evening. In an interesting reversal of the usual situation, the NWS GFS has a stronger system over the West and one that is centered further west than the similar trough forecast by the ECMWF. The GFS seems to have forecast stronger blocking west of, and over, Greenland, which is keeping the upstream features further west. This is a bit of a dilemma, since the ECMWF has usually been superior to the GFS at longer ranges. The GFS forecasts a fairly significant and widespread precipitaion event across much of the Southwest US centered out around 156 hours (all 12 of the GFS ensemble members have preciptation in the Southwest and southeastern Arizona for several periods, which is quite impressive for the GFS). Thus, the GFS forecasts a wet ending for 2010, while the ECMWF is more ambiguous. Guess I'll have to root for the GFS! Hope that everyone who visits here has great Holiday weekend! Two early morning views - top is looking south from Kitt Peak and bottom is looking north from Univ. of Arizona campus. 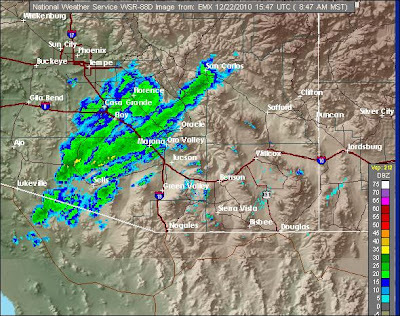 Showers are mostly off to the east of Tucson at this time. This event has played out locally very much like the event of last week. The tremendous amounts of precipitation over much of the rest of the West, however, were amazing and record-setting - making a post about our minor event seem of little importance. 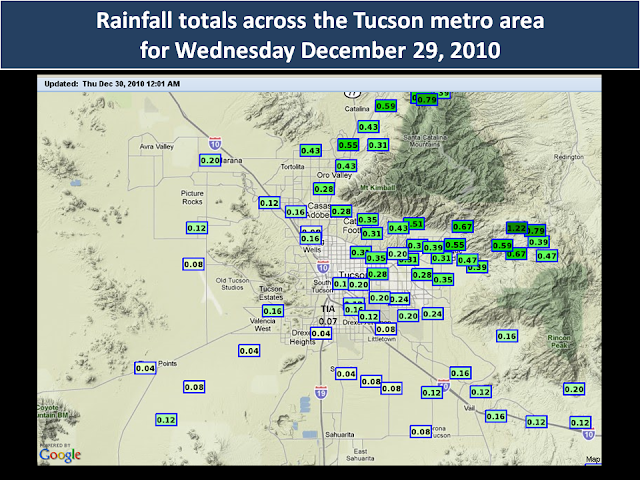 The Pima County ALERT network had 100% coverage for rainfall with all 93 gauges having measurable rain. Amounts were again highest in the Catalinas, and other higher elevation gauges. There were 24 sites with more than 0.50" and 2 sites had more than 1.00". Amounts within the immediate, lower elevation, Tucson metro area were generally 0.2" to 0.4" and here at the house there was 0.29" in the gauge at 7 am. 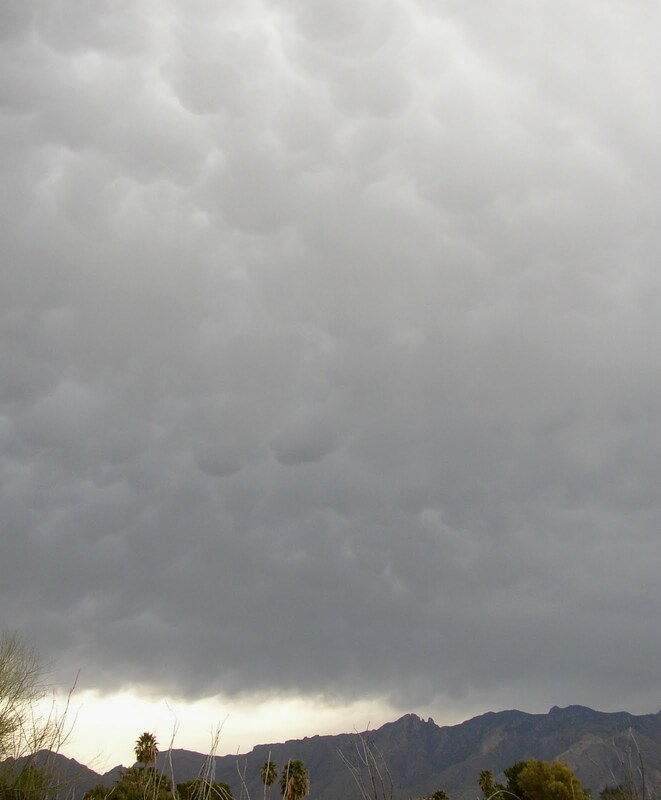 Two more images from today - top is of mammatus overhead around 11 am this morning; bottom is of sunlight breaking through the clouds a bit before sunset today, 22 December 2010. The past few days have been pretty amazing for Southern California. The rainfall totals keep going up and up. As of Wednesday afternoon, the seven day precipitation for San Diego is about 4 inches, 6 inches in my foothill town of Alpine, 13 inches on Palomar Mountain, and a whopping 25.84 inches at Lytle Creek in the San Bernadino mountains. It's been too warm for snow around here, but Mammoth has had 11 to 16 FEET since last Friday! It looks like the fun is about over, although we might get a stray thunderstorm or two tonight. Images around 8:50 am this morning. 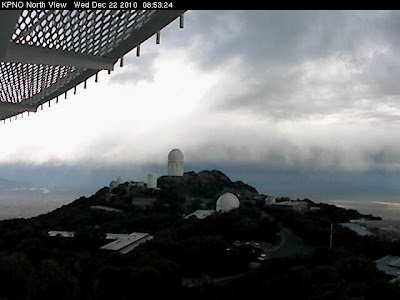 Top - view from Kitt Peak looking north toward the main band of showers to the northwest of Tucson. 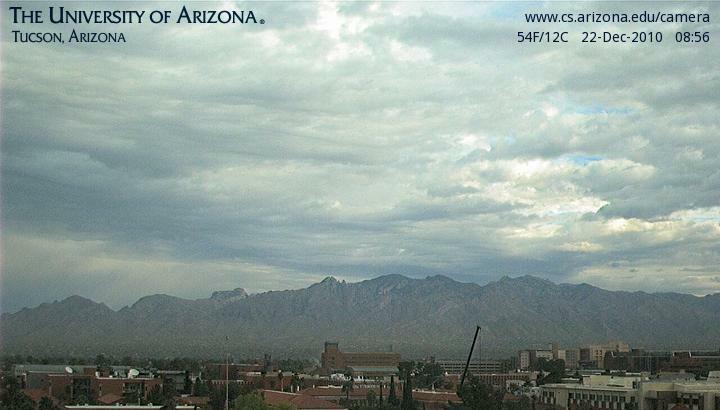 Middle - view of clouds over Catalinas along with Tucson's currently dirty air. Bottom - NWS composite reflectivity from the TUS radar, showing increased echoes to the northwest. 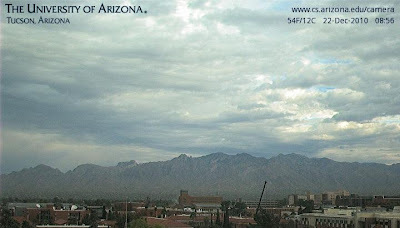 Here in the southeast of Arizona this week's weather event has been one of chaotically cloudy skies and no precipitation. 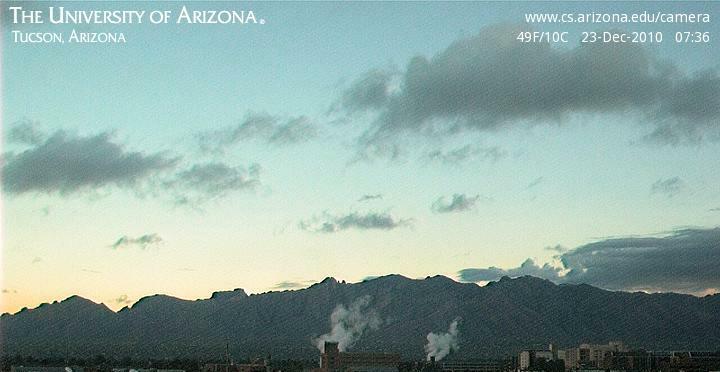 The first plume of Pacific moisture came by with no weather, other than the cloud layers, and this morning there is a line of light showers off to the northwest of Tucson. 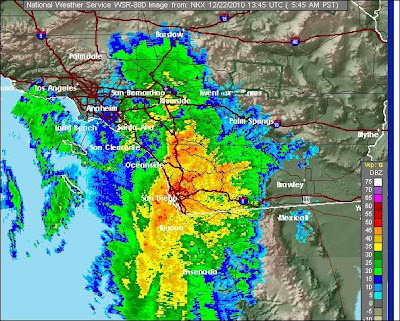 The serious rainfall continues to cover much of California. The 1345z composite radar from San Diego is shown in top image. Heavy rains, flooding, and numerous landslides have led to a disaster emergency in most of the southern California Counties this morning. The extreme rainfalls extend into southern Nevada. The middle image is the 1330z IR image for the Southwest US. The cloud swirl to the west-southwest of San Diego indicates the position of the 500 mb cutoff this morning. The models continue to forecast the cutoff to move across central Arizona during the next 24 hours. The bulk of the rainfall/snowfall is indicated for central and northern portions of the state, with a brush-by for southeastern Arizona. The WRF-GFS run from midnight indicates only light rains for lower elevations down here, and a better event for some of the mountains. The WRF-GFS forecast of composite radar echoes for midnight tonight (Wednesday December 22nd) is shown in the bottom image. Continuing to watch and wait! The unusual Pacific moisture plume (most recent PW image top from CIMSS) has resulted in extremely heavy rains and snows, especially in California. Rainfall totals in the LA Basin this morning are generally from around 4 to 8 inches. Snow amounts from the Sierras inland to the Wasatch have been very substantial and with high liquid content. 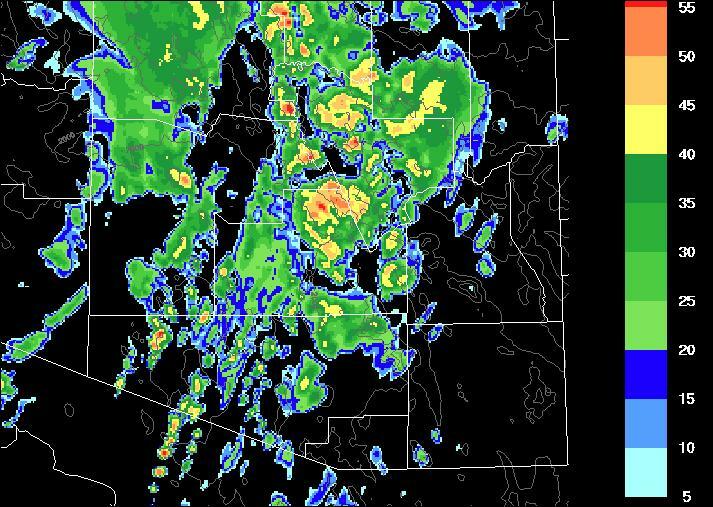 The models generally agree that the final short wave of this event will move across Arizona tomorrow and tomorrow night, with highest precipitation amounts in the northwest and the RIM Country and a brush-by down here in the far southeast. The ECMWF is a bit slower and further south than the other models, and has a cutoff present at 500 mb as the system moves into the state. 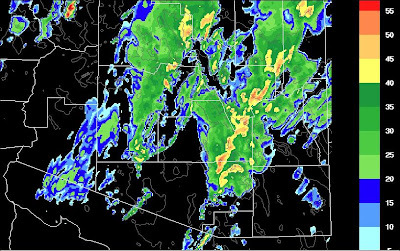 The WRF-GFS run at U of A Atmo this morning predicts a couple of bands of showers, and perhaps a bit of thunder, moving across Arizona at 9 pm tomorrow, Wednesday December 22nd (middle image is the forecast of radar composite reflectivity). Precipitation totals (bottom image) for the period from this past midnight through 6 am on Thursday morning are generally less than half an inch in southeast Arizona, except in the Catalinas, where the model again forecasts a very nice precip event. So we will now watch to see what actually happens. All of the models are now indicating a nice (mostly rain except at highest elevations) precipitation event for Arizona through midweek this week. This occurs as a short-wave trough at 500 mb swings in from the Pacific, shifting the current moisture plume south and eastward. Amounts will be lightest down here in the southeast. The models have so far been way too wet in northern and northwestern Arizona, but a significant precipitation event appears likely for central and northern mountain areas as the deep moisture plume from the Pacific (see earlier posts about this feature) moves across the state. The event is likely to be focussed around Wednesday evening here in southeast, although timing and the exact track of the vorticity maximum varies in the different model forecasts. Top figure shows the ECMWF forecast, from the operational version, that is valid at 5 pm on Wednesday (22 December 2010). The model forecasts a nice band of deep moisture extending well south into northwestern Mexico. Middle figure shows the operational NWS GFS forecast of accumulated precipitaion valid at 5 am on Thursday morning - with the southeast to northwest gradient of amounts very pronounced, as with last week's event. 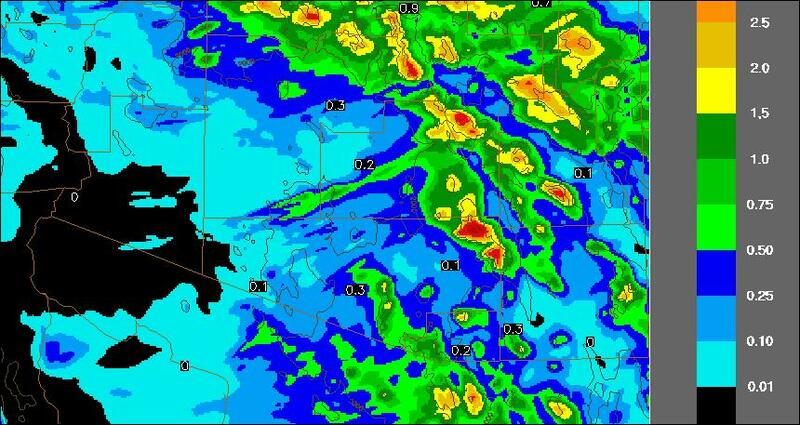 Bottom figure shows output from the U of AZ Atmo run of its WRF-GFS model from midnight last night. 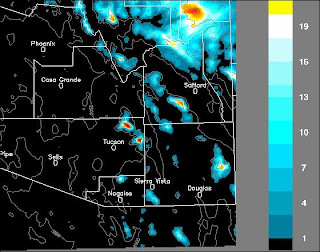 The image is of model forecast radar composite reflectivitiy at 5 pm on Wednesday afternoon, indicating two bands of showers moving across southeastern Arizona. 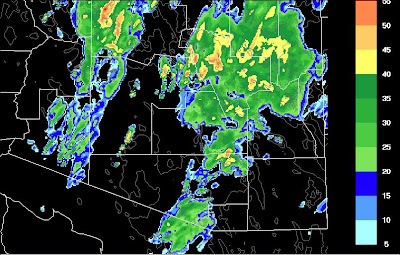 The model forecast indicates that 3 or 4 bands of showers could move across the Tucson metro area before this event ends. Once again, it will be interesting to watch how the details of this event actually evolve during the next three days. How Much Snow In The Catalinas? Chance of Rain on Thursday? Weekend Blizzard In Chicago Area?